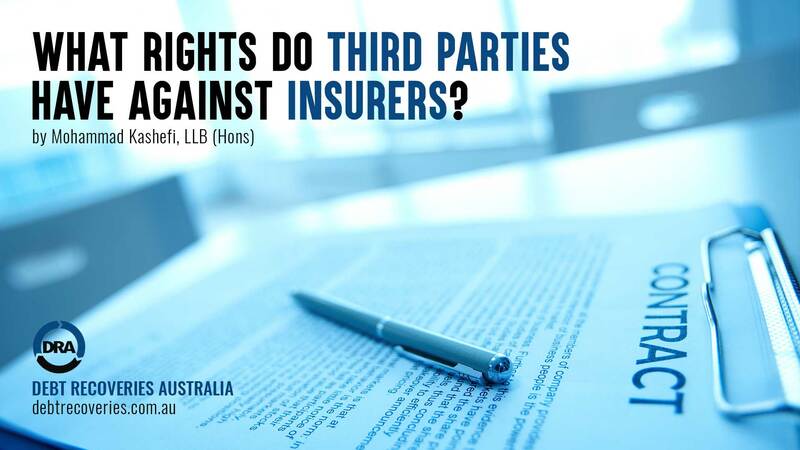 The rights of third parties against insurers is primarily regulated by section 51 of the Insurance Contracts Act 1984 (Cth) (“ICA”) and incidentally through section 54 of the ICA. Prior to the introduction of the ICA, section 51 only covered compulsory third party situations; other areas, such as property and marine insurance remained largely unregulated. Section 51 of the ICA now covers all types of liability insurance. In summary, section 51 states that a third party who has a claim against the insured person or the third party beneficiary of the insured person, can instead proceed directly against the insurer in the event that the insured is dead or cannot be found after reasonable attempts. The equivalent of section 51 for corporations is section 601AG of the Corporations Act 2001 (Cth). This section gives the right to a third party or any person to bring an action directly against the insurer of a deregistered company for any amount that was payable to that person under the Contract of Insurance (‘COI’). Thus, in case of corporations, Section 601AG can be used in conjunction with section 51 of the ICA. Section 51 is subject to two requirements; first, the establishment of liability on the part of the insured, and secondly, under s 54, the liability of the insurer is reduced to the extent to which the insurer’s interests were prejudiced. An insurer’s interest is prejudiced if the insured person was for instance, in breach of one of the terms of the COI. This however, does not give the right to the insurer to completely refuse the claim. The liability of the insurer is reduced to the extent to ‘which their interest was prejudiced’. Thus section 51 of the ICA is partly subject to section 54; meaning that the third party must establish that the insurer’s rights are not prejudiced by some actions of the insured person. Additionally, it is argued that section 54 of the ICA incidentally creates a supplementary right for a third party to pursue an insurer directly under that section in limited situations, such as non-payment of excess by the insured. Section 54 of the ICA is enlivened when the doing of an act or the making of an omission by the insured would excuse an insurer from an obligation to pay a claim for a loss actually suffered by the insured. If the insured person is in breach of the COI but the breach does not prejudice the right of the insurer, the insurer cannot refuse the insured person’s claim. However, the insurer’s liability is, with respect to that claim reduced by the amount that ‘fairly represents the extent to which the insurer’s interests were prejudiced’ as a result of that act. First example: Assume B’s Bentley was not insured and B pays for the costs of repairs from his own pocket, and he is now directly claiming the $50,000 damage that was caused by A from A’s insurer. A’s insurer refuses to pay B because A has not met ‘his policy obligations’; namely A has not paid his $1,000 excess. B can demand the $50,000 from A’s insurer under section 54 of the ICA. The insurer is then under an obligation to settle B’s claim under section 54 less the excess of $1,000. The $1,000 excess is the extent to which the insurer’s ‘liability was reduced’ due to the prejudice caused by the insured. If the insurer refuses B’s claim under section 54 simply because A has not paid the excess, then the insurer is arguably in breach of section 54 of the ICA. Although section 54 does not expressly create a right for a third party to claim directly from the insurer of the other party, the wording of the section is such that it does so incidentally. Thus, it is argued that in addition to having the right to sue an insured person directly, a third party has a right under section 54 of the ICA to pursue the insurer in cases where the insurer refuses payment due to non-payment of the policy excess. Second example: Assume again that B is not insured and pays from his own pocket to fix his Bentley. B attempts to contact A but he is unsuccessful. B then contacts A’s insurer but he is rebuffed. A’s insurer is claiming that A has disappeared and they cannot locate his whereabouts. B then hires a private skip trace agent and demonstrates to the insurer that, after reasonable attempts, he was unsuccessful in locating A. Section 51 of the ICA is triggered. The insurer is under an obligation to settle B’s claim. However, B must also prove that A was liable for the accident and that A’s insurers rights are not prejudiced by A. The examples provided above makes it very clear that insurers must settle third parties’ claims. However, in reality it is decided otherwise. In fact, there are so many conflicting opinions on section 51 claims that it is worth reviewing some cases. Bayswater v Hannell  WASCA 34 is a case which related to a Brunei citizen (Perraton) hiring a vehicle in Western Australia. The vehicle was hired from Bayswater Car Rental. During the course of hire Perraton was involved in a motor vehicle collision for which he was responsible. Perraton went back to Brunei and Hannell attempted to recover his loss from Bayswater on the basis that the rental agreement between Bayswater and Perraton provided insurance cover to Perraton. The relevant clause of the rental agreement provided; “not being an insurer, the Owner provides collision indemnity to the renter, only during the agreed rental term”; (at 23). This single clause of the agreement was interpreted differently by the Magistrate, the Commissioner, and the Court of Appeal. The interpretation was pursuant to section 10 of the ICA that defines what a COI is. At the first hearing the Magistrate held that the relevant clause did not constitute a COI. Rather it was an undertaking to cover the damage to the rental vehicle caused by the renter. When the matter was appealed to the Commissioner (Mr Greaves), he was of the view that the rental agreement amounted to a COI. Mr Greaves considered that the contract did provide insurance cover in respect of Perraton’s to Hannell (at 29). The Magistrate’s decision was overturned. Subsequently the decision of the Commissioner was also appealed (30). The Court of Appeal held that the Commissioner erred and he should have actually found that the indemnity clause was a provision of the rental agreement, rather than a COI. The decision was thus sent back to the Magistrate for re-hearing (at 75). Although this decision does not demonstrate that section 51 was the primary issue, it does show that a third party’s rights were clearly violated. Hannell was an innocent party in the car accident and his claim failed because he could not establish that the relevant indemnity provided to Perraton extended to him. This was because the ultimate decision of the court was that the dominant purpose of the contract was to evidence a rental agreement – not a COI. The author submits that the decision of the Court of Appeal was legally correct. However, it was not a just and equitable decision. If indemnity is provided to a driver of a motor vehicle, then this indemnity should extend to innocent third parties who suffer loss as a result of the driver’s acts. In the Murry’s Transport New South Wales Pty Ltd v CGU Insurance Ltd  SASFC 100, CGU Insurance (‘CGU’) refused to pay out a claim by Murry’s Transport (‘Murry’). CGU’s client died during the collision and his estate later went bankrupt. Murry brought its action directly against CGU pursuant to section 51 of the ICA. The central issue in this case was that CGU’s client was driving on the wrong side of the road and had caused the accident. Upon reviewing the evidence and on the balance of probabilities the trial judge found that the insured had intentionally driven on the wrong side of the road in order to take his own life. The trial Judge dismissed Murry’s claim on the basis that CGU’s client had intentionally caused the accident to take his own life, and therefore the deceased insured was in breach of the COI. Murry appealed this decision. The Court of Appeal found in favour of Murry. On appeal, it was held that the Trial Judge had erred. The Trial Judges finding’s were based on inferences from uncontested facts. After reviewing all the evidence, the Court of Appeal concluded that the evidence was ambiguous in that, it was not clear whether the deceased deliberately brought about the collision or whether it was as a result of his negligent driving. It was concluded that on the balance of probabilities the deceased insured was negligent. Although Murry’s case appears to be a success story for section 51, it is not. The case clearly demonstrates the intent of the insurer in trying to deny Murry’s claim. Murry’s claim was over $150,000. Had it been under $10,000 it is argued that the insurer may have paid the claim out or settled at a lesser amount. Had Murry chosen not to appeal, they would have not been able to recover any damages at all. It is clear from the facts of the case that CGU did not have a proper basis for refusing to pay the claim and their success at trial is partly due to the ambiguity of ICA. This is because the only section within the ICA that expressly protects third parties against insurers is section 51. This in itself is insufficient and it is argued that the government knows this and yet nothing has been done to enhance third parties’ rights under the ICA. The ICA does not sufficiently deal with the rights of third parties against insurers. Most insurance law firms are not interested in litigating against insurers under section 51 mainly due to legal costs, lack of clarity of third parties’ rights under the ICA and limitations of case law. It is therefore submitted that more needs to be done to protect third parties. There are certain areas such as bankruptcy and financial hardship that section 51 does not even deal with. Section 54 only incidentally protects a third party in the event of a non-payment of policy excess by the insured. The ICA is ambiguous and hard to read for lay people. It is unfair that third parties and judges are only limited to using section 51 in establishing third parties’ rights. Section 51 of ICA is wholly inadequate in terms of protecting the rights of innocent third parties. It is time for reform, in the shape of new legislation or amendment of the ICA so that the law adequately protects the right of third parties against insurers. We are experts at recovering outstanding debt and claims without the drama. For more information, email at us email@debtrecoveries.com.au or call 1300 799 511. Talk to us about your debt collection concerns via Skype at debtrecoveries. ← What happens when hire car costs are excessive and what is the limit on hire car costs?